Denys Molchanov match-fixing allegations: Pro tennis has a match-fixing problem. Pro tennis has a match-fixing problem in its lower ranks. Denys Molchanov of Ukraine returns a shot during the China Open on Sept. 27, 2014, in Beijing. In the last month, men’s tennis has seen a handful of professional players accused—either in well-circulated rumors or by authorities—of involvement in match-fixing. Given that it takes only one player to decide the outcome of a match, tennis is more vulnerable than most other sports to thrown matches. It’s impossible to determine how widespread the problem is, but given the huge amounts of gambling money that can be transacted at lower-level tournaments compared with the paltry prize money, the allegations are inevitable. With alarming regularity, knowledgeable tennis observers have been able to tell who is going to win by spotting live betting odds that defy logic. One recent match is illustrative of the problem of tennis match-fixing—it is very easy to spot potential cases, but also very hard to prove. In a lower-profile tournament in Dallas earlier this month, 174th-ranked Denys Molchanov was leading 303rd-ranked Agustin Velotti early in their first-round match, as had been projected in pre-match odds. But as Molchanov took the lead in the first set and eventually won it, money was actually being heaped onto Velotti and Molchanov’s odds of winning grew worse. With many gamblers spotting the dubious pattern and throwing even more money onto Velotti, the market grew saturated, with nearly $900,000 wagered. Sure enough, Velotti won the second and third sets, and the match. While some bettors struck rich, several bookmakers had voided bets on the match before it ended; some have still not paid out more than three weeks later. Velotti has denied any knowledge or involvement in a possible fix. Ryan Harrison, a 22-year-old American who has ranked as highly as 43rd in the world, also played in the Dallas Challenger tournament, and said the Molchanov incident dominated conversation in the locker room there. Harrison has spent time training at the same academy as Molchanov in Florida, and he said he was not surprised that the Ukrainian would be a player caught up in match-fixing allegations after previous conversations they’d had on the topic. Requests to speak to Molchanov were not granted by tournament officials at the Dallas Challenger (where Molchanov stayed the rest of the week and eventually won the doubles title), nor by officials at the Challenger in Cherbourg, France, where he lost in the first round this week. A message left for Molchanov with his doubles partner in Dallas has not been returned as of press time. Ian Dorward, a sports modeler who previously worked as a tennis trader and head of minor tennis for major bookmakers, has written case studies about matches he believes show evidence of fixing, including Molchanov’s loss to Velotti. Dorward believes that the majority of fixing happens at the sub-match level, with players intentionally losing specific sets or games, which can also be bet on. If both players are in on a fix, then they could even coordinate specific scores. In one match that Dorward detailed last summer, two Dutch players who had never cracked the top 200 played a first-round singles match at a Challenger event in Meerbusch, Germany. Before the match began, it became clear that the betting market had a hunch that 248th-ranked Boy Westerhof would win the first set before losing the second and third to 280th-ranked Antal van der Duim. As the match progressed, the odds consistently reflected such predetermination despite Westerhof leading 6–4, 3–0 midway through the match. But, as the money had foretold, Westerhof lost the next six consecutive games to drop the second set, and then dropped the third set as well. The pair were also doubles partners that week, but the alleged fix was never proved. In an intrinsic vulnerability to the integrity of tennis matches, the money the players earn for playing in the lower tiers of tennis is dwarfed by the money at stake for bettors. For example, on Wednesday more than $150,000 was wagered on an unsuspicious second-round Challenger match in Cherbourg. The winner of the match received $1,414, and the loser earned only $829 for reaching the second round. (A first-round loser in Cherbourg nets only $500.) With those sorts of total amounts being waged, moderate inside bets could easily go undetected. Harrison and Dorward agreed on the general profile of a likely match-fixer: a player who has toiled away on the lower circuits for years without ever breaking into the sport’s upper echelon or accruing significant prize money. The explosion in online betting has coincided, fortuitously for would-be fixers, with the ubiquity of social media. Nearly every player is now reachable via Twitter or Facebook, where they can be anonymously offered bribes that can dwarf their legitimate on-court earnings. Take, for example, this series of Facebook messages received in 2010 by a player who dipped in and out of the top 200 and earned less than $75,000 in prize money that year. (He has since broken the top 100.) Sure enough, a man named “Vadim” came along and offered him $300,000, more than quadruple his income, to lose a match. As I wrote in 2013, social media is also frequently used by aggrieved gamblers to harass players whom they have placed losing wagers on. While some of the messages are fueled purely by spite, some come with direct accusations of match-fixing. A different expanding technology, live-streaming of matches, might actually help disincentive corruption. 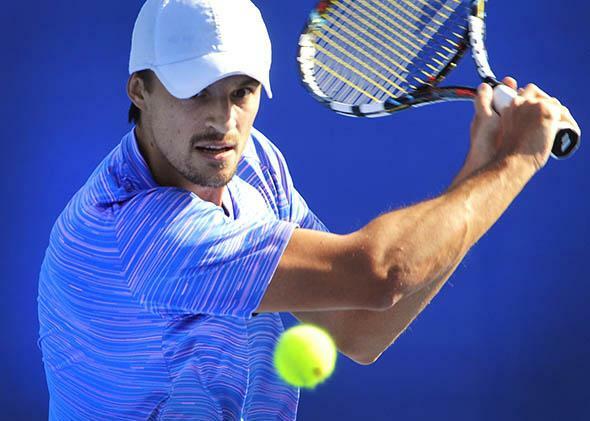 While most matches at lower levels are not streamed or televised, Molchanov-Velotti was, as part of the United States Tennis Association’s push to expand video at its events. So when the patterns raised eyebrows, the match could be watched, scrutinized, and even GIF’d. Yet despite the evidence in the Molchanov case, Dorward does not expect him to be punished. “While I accept that it is incredibly difficult to prove a player’s connection to match-fixing, the fact that so little ever seems to happen gives little hope that anything will happen this time,” he said. Without finding definitive links between players and fixers, thrown matches are just too difficult to prove. In the six and a half years since the ATP, WTA, ITF, and Grand Slams formed a watchdog body to monitor fixing, the Tennis Integrity Unit has handed lifetime bans to only four players and one official. Five other players have been given shorter bans. The Tennis Integrity Unit operates in complete secrecy, refusing to comment outside of its brief statements when punishments are handed down or successfully appealed. These numbers fall far short of the suspected numbers of fixers, and don’t even reflect those who have been punished by other enforcement agencies, including crackdowns this year by police in Australia and prosecutors in Italy. “I can understand why the TIU do not want to release information about the players that they are investigating,” said Dorward, citing a presumption of innocence. But the fact that authorities release so little public information, Dorward believes, gives the impression that they’re not doing anything, even if that isn’t actually the case. For his part, ATP chief executive Chris Kermode has said ensuring the legitimacy of tennis results is a priority for his organization, which is one of the signatories of the Tennis Integrity Unit. But many players share Dorward’s lack of confidence in the Tennis Integrity Unit, citing a lack of responsiveness when they have reported suspicions, or even approaches from individuals who wanted matches fixed. “I went through the proper channels and reported it to the TIU, but nothing ever came of it,” said the player who was contacted by “Vadim” on Facebook. Peter Polansky, a Canadian who reached a career high of 122nd last year before being sidelined by a wrist injury that has seen him slip to 202nd, was another who expressed a sense of hopelessness at the situation.